Check out our reaction to the trailer, along with our prediction for the film back in May, here! The second of four in Dashner’s young adult series following a group of teenager’s struggles against the evil corporation WCKD. Still in the shadows of its more successful teen counterparts, many would hope that this is the film to put Thomas on the same stage as Katniss and Tris’. It is important to mention that I have read the Maze Runner series, albeit nearly two years ago now. I have also read all of the Divergent and Hunger Games books, among other YA series’. 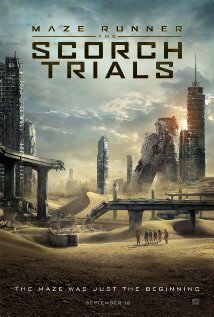 Now, I don’t exactly remember the Scorch Trials book off by heart, but out of all the YA book adaptations I’ve read before seeing the respective film, none have deviated as much as this from the source. Again, my memory is fairly sketchy so don’t get angst-y if I’m wrong, but this was almost nothing like the book! So much of the plot, order of events, locations and method of getting stuff done or to places was changed that the film is almost a remake of the original story created by James Dashner. What it has kept though is the characters, and I think if anything is going to separate this from its more successful cousins is the group mentality. This isn’t one person standing up and everyone else falling in behind them, this is a group all fighting for each other. That’s a really good quality that Wes Ball and screenwriter T.S. Nowlin have really pushed to the forefront of this movie. Sure, the back-and-forths between the kids does mean that some of the drama is lost, however I think these films have to do something that Divergent and Hunger Games aren’t, and Scorch Trials definitely does camaraderie much better than the others. In another positive, I thought the zombies looked excellent (although I’m always a sucker for a zombie! ), and added something to the movie that I never expected to see. This movie has a very good cast, and they all delivered solid performances here. Dylan O’Brien was pretty good, showing a decent range throughout. He also comes across as a very extravagant actor, somebody who could naturally fit into an action based blockbuster in the future. I’ve been really impressed by Ki Hong Lee in both the Maze Runner movies, along with Brodie-Sangster, and they both seem like people with promising careers ahead of them. My only concern, with these three especially, is that at some points their conversations did seem a bit ‘school nativity’, and that would have to be fixed. Esposito and Salazar both played exciting characters, and as such delivered very exciting performances. Overall I think Esposito was okay, but I was really impressed by Rosa Salazar, who I think after O’Brien delivered the performance of the movie! Out of the other two, Aiden Gillan was a very convincing bad guy, and I’m still unconvinced by Scodelario as I don’t think she’s really had that much to do in either film! The directing by Wes Ball was fairly good. It won’t surprise anyone that many of the shots in this film were similar to shots used in the previous Maze Runner film (also directed by him), but they were still pretty good, especially during running action scenes. Firstly, this was definitely better than the first film. It just seemed more adult, more serious, more believable than the previous. However, this is still a long way behind the Divergent and Hunger Games movie franchises in my opinion, as I think this film lacks the bite that the others have. It’s a step in the right direction, and the young cast and debut director definitely show promise for the future, but in an era where YA dystopia is sky rocketing, I cannot see The Maze Runner being remembered 5/6 years from now.